Group Study Rooms: Group study rooms on the 4th floor may be reserved up to a week in advance. Each seats 4 to 10 people and is equipped with a computer and whiteboard. Additional study rooms on the 2nd and 3rd floors are available on a first come, first served basis. Group Study Rooms are checked out at the Service Desk. Usage policy. Meeting Place 2: Meeting Place 2 is a semi-enclosed space in room 248 on the 2nd floor. It is large enough to accommodate 16 people and features flexible furniture and movable whiteboard partitions. A laptop may be checked out from Technology Services and hooked up to a large screen ceiling-mounted monitor. Meeting Place 2 is checked out at the Makerspace desk. Usage policy. Presentation Practice Rooms: Practice and record your presentation. Three large group study rooms on the 2nd floor (248B, 262B, and 201D) are equipped with large wall-mounted monitors and recording devices to allow students to practice and record presentations. Presentation Practice Rooms are checked out at the Makerspace desk. Usage policy. Makerspace Green Screen Room: The Multi-Purpose MakerSpace Room (201D) is for various MakerSpace activities including Green Screen shoots, Tech Coach sessions for software in the Mac Lab and the MakerSpace, Virtual Reality class assignments. Graduate students working on long-term research projects may apply for a study carrel along the back of the 2nd, 3rd, and 4th floors. 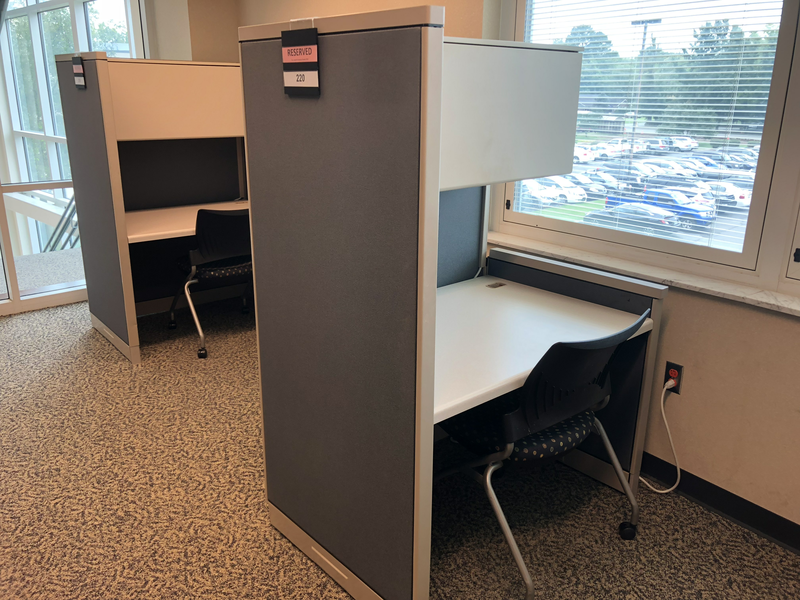 Graduate Research Carrels are individual units with a work surface and a small lockable storage area for books and papers. Complete the linked form and return it to the Service Desk on the 1st floor. More info: 615-904-8533.